Who needs a new Jeep when you got a CJ?! I have owned two different CJ7's. The first was used just around the farm. I sold it when I moved out to Texas and found this '85 CJ7 this summer. I had never done any crawling in a jeep before but got talked into going on a trip that was a fundraiser for Veteran Ride and Drive next year. 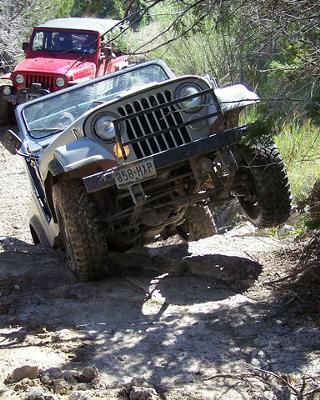 In my group was a heavily modified TJ, a new LJ and a JK that had been lifted and locked. MY CJ is completely stock besides some tall shackles. I head off on the trail with these guys and make it over all the obstacles they do. Now I did have to take a different line. The little CJ could go between some rocks that the others went over! I was surprised that it did as well as everyone else in the group. What a great Jeep the CJ is!! Larry's Comment: Nice frontal shot photo of your '85 Jeep CJ7 Chris. Thanks!